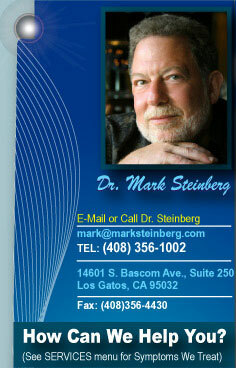 Mark Steinberg is a practicing licensed psychologist in Los Gatos (San Jose), California. His areas of specialization include Voice Technology Thought Field Therapy, EEG biofeedback, mental fitness training, cognitive retraining, and technology-assisted learning therapy for individuals with academic, motivational, and neurological problems. In addition, he provides individualized consulting and counseling in the areas of academic and job performance, career development, stress and time management, conflict resolution, cognitive and social skills development, and communication. Dr. Steinberg holds a doctorate in psychology and a masters degree in education from the University of Buffalo. He is licensed by the California Medical Board and the California Board of Behavioral Science Examiners. He has served as an adjunct professor at National University in San Jose, California, an Assistant Professor at California State University, Northridge, and an Examiner on the licensing panel for the California Board of Behavioral Science Examiners. He has also done management consulting for corporations and public agencies, providing training for managers and sales staff, focusing on employee development, communication, and organizational effectiveness. He developed and wrote software and hardware technical manuals and training programs for the high-tech and defense industries. His corporate clients included: HP (Hewlett-Packard), Westinghouse, Digital Equipment, Atlantic-Richfield, and Xerox. With 25 years of experience in clinical, educational, and neuropsychology, Dr. Steinberg is considered an expert in the fields of assessment, child psychology, learning disabilities, attention deficit disorder, behavior modification, and neurocognitive rehabilitation. He has extensive experience working with children and families. As a practitioner of Voice Technology, Dr. Steinberg is among a very few select professionals trained to use this technology for healing and eliminating any negative feeling within minutes by phone. He assists clients throughout the world. He provides mental fitness and peak performance training programs for organizations and individuals. Dr. Steinberg has made numerous appearances nationally on television and radio, including appearances on ABC in Los Angeles and San Francisco, NBC in San Francisco, Atlanta, and Las Vegas, and FOX TV in Phoenix. He is the author of a forthcoming book entitled, Your Problem Is Gone: You Can Get Rid of Any Negative Feeling in Minutes. He is represented by two public relations agencies in Los Angeles. You can get better and stay better with natural treatments that use your brain’s ability to heal and improve itself.